This 29 year old patient transferred into the programme from another public sector programme in the province. She had initiated TDF/3TC/NVP in November 2010 with a baseline CD4+ cell count of 2 cells/ul. The transfer letter states that after 6-month of ART, her CD4+ cell count was 23 cells/ul and viral load 240,508 copies/ml. CD4+ cell count and viral load were repeated on transfer (12 months on ART) and show persistent high-level viraemia and CD4+ cell count <50 cells/ul. Initial questioning does not reveal any adherence problems. However, in-depth counselling reveals deep psychological issues around the death of her grandmother the same year. She is now living with her mother who is also on ART and is documented to have excellent adherence and VL <40 copies/ml. She reports no previous use of ART or PMTCT before November 2010. She reports that, although her partner HIV status is not known to her, she is aware that the partner has concurrent sexual partners, and knows at least one of them to be taking ART. This patient has had no virological or immunological response to ART. This would normally suggest substantial problems with adherence to ART. Other possibilities to think about would be malabsorption, incorrect drug dosage or major drug-drug interaction. It is also important to consider the possibility of pre-existing antiretroviral resistance, either from previous PMTCT or from acquisition of resistant virus. Resistance genotype: Dual class resistance has seemingly developed within one year of therapy which is of major concern. The M184I mutation confers high-level resistance to 3TC and FTC. K65R confers intermediate resistance to TDF, ABC, ddI, 3TC and FTC. Y181C confers high-level resistance to NVP and EFV. The rapid emergence of mutations and lack of any virological response to ART does raise the possibility of primary drug resistance in this case. Treatment recommendation: The viral populations remain fully susceptible to AZT . Indeed both the K65R and Y181C mutations cause AZT hypersusceptibility. So a standard second-line regimen of AZT, 3TC and LPV/r would be appropriate in this case. Adherence: It is essential that the psychological issues that have been identified are comprehensively addressed. This might include referral to a clinical psychologist or consideration of pharmacological therapy. It is important to ensure that the patient now also enrolls the full support of her mother, especially given the documented good adherence of the mother. General comments: A full drug history should be taken to ensure no potential drug-drug interactions with her second-line regimen. She needs to be screened for TB disease and for sexually transmitted infections. It is important to ensure that she is currently taking cotrimoxazole therapy. Counselling about condom use is particularly important given the knowledge of the partner concurrent sexual partners. I. We are much more used to seeing the M18V mutation ? What is the significance of the M184I mutation seen in this case? II. How do certain mutations cause hypersusceptibility to certain antiretroviral drugs, e.g. K65R and AZT? I. M184I arises as a result of a G to A substitution at position 184 (ATG, methionine to ATA, isoleucine). M184V in contrast arises as a result of an A to G substitution (ATG, methionine to GTG, valine). M184I mutants are generally observed earlier during therapy than M184V as RT is more prone to G to A substitutions. M184I confers high-level resistance to 3TC and FTC but also significantly reduces the replication rate of the virus. In the presence of continued drug pressure, the frequency of M184V mutants increases, as the M184V mutants have a fitness advantage over M184I mutants. II.K65R confers hypersusceptibility to AZT by partially preventing the excision of incorporated AZT. This leads to increased stability of AZT as a chain terminator. The mechanism by which the K65R mutation counteracts TAM-mediated NRTI excision seems to be that the K65R mutation constrains the mobility of the RT fingers loop domain, explaining the decreased incorporation and decreased excision of NRTIs observed for K65R. The clinical impact of this hypersusceptibility is not entirely clear. a href="http://www.ncbi.nlm.nih.gov/pubmed/16640096">White KL, Chen JM, Feng JY, et al. 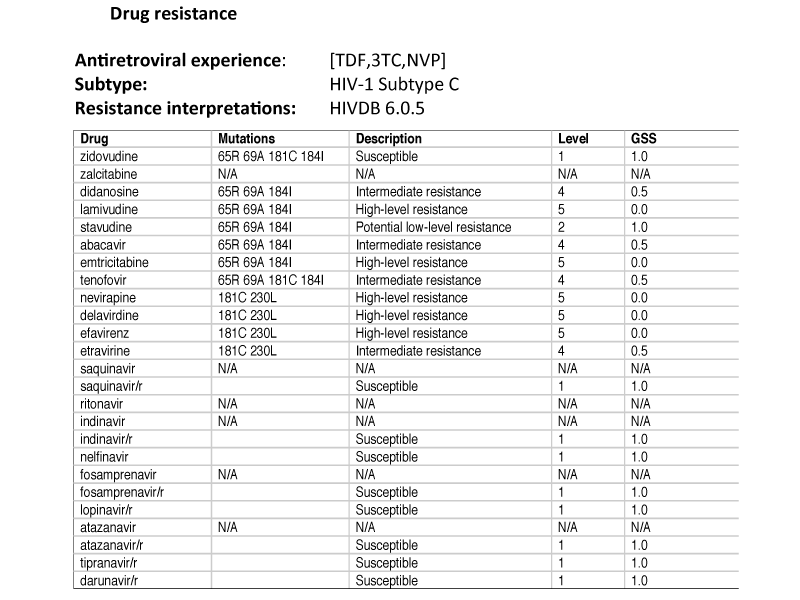 The K65R reverse transcriptase mutation in HIV-1 reverses the excision phenotype of zidovudine resistance mutations. Antivir Ther 2006, 11: 155-163.